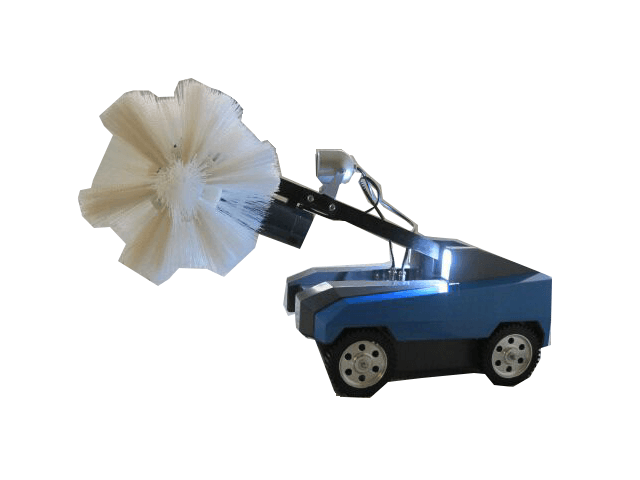 Equipped with front and rear infrared color video camera (complete with high intensity illumination), auto up/down rolling brushes, this robot can loosen dust or particles that are attached on the side walls of air duct over time and paving way for subsequent work to be done by dust absorbing robot (by way of direct dust absorption method) or alternatively dust can be extracted at the other end of the air duct by means of a high power vacuum dust collector (by way of raised dust absorption method). Size of Air Ducts to be cleaned: Height 180mm ~ 600mm (with lateral rolling or rotating brush) x width (no limitation) and if round duct diameter could be 500mm or more. Video Recording & Illumination: Double front and rear, 420 lines, industrial grade, 360° auto rotating, 180° adjustable tilting, video color camera. Four (front and rear) scatter type high intensity illumination (3Ls - long life, low temperature, LED).